This pâté-style loaf Entrees and the tender, meaty Slices in gravy provide variety as well as complete, balanced nutrition and a source of moisture that can be beneficial to small dogs. Gram-for-gram, wet foods like the Cesar® brand have fewer calories than dry food. Paired with Cesar® Dry food, it makes a perfect meal for small dogs. Now you can add more diversity to your small dog's meals by picking up our convenient variety 18-pack! 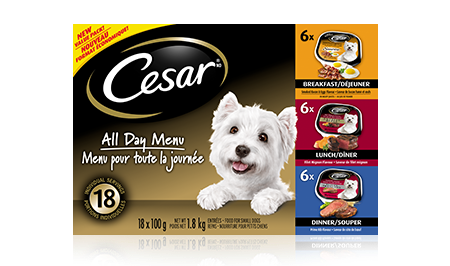 CESAR® ENTRÉES & SLICES: ALL DAY MENU 6 PRIME RIB, 6 FILET MIGNON & 6 BACON EGG 18x100g is rated 4.6 out of 5 by 37. Rated 5 out of 5 by JEANDSK_3601041096 from I think it's important to introduce new flavours. My dog has Cesar at each meal. We only feed him about 1/4 of the container at each meal. He was getting a bit bored with the same flavours day in and day out. I can see that he really enjoys having something different. Rated 5 out of 5 by ANNETTEGSK_3601058757 from Our dogs really loved all of the Little Cesar flavors. With both being senior dogs with bad teeth the food was very easy for them to eat. Nice treat for them. Bery convenient and easy to open. Will definitely be buying some to have on hand. Rated 4 out of 5 by HAYLEYBMB_3601038907 from They liked all the flavours alright but weren't huge fans of the bacon and egg flavour. They also preferred the ones that weren't slices. Overall I'd say my dogs enjoyed this product though. Rated 5 out of 5 by CAROLINEKON_3601044130 from The aroma to the food is good. There is a jelly in each container which my dog, and her friends adore. I mix this wet food in with the dry kibble and they are in heaven. CESAR® Slices Prime Rib Flavour in Sauce is formulated to meet the nutritional levels established by the AAFCO Dog Food Nutrient Profiles for maintenance. CESAR® Entrées Filet Mignon Flavour Food For Small Dogs is formulated to meet the nutritional levels established by the AAFCO Dog Food Nutrient Profiles for maintenance. CESAR® SUNRISE™ Smoked Bacon and Eggs Flavour in Meaty Juices is Formulated to Meet the Nutritional Levels Established by the Aafco Dog Food Nutrient Profiles for Maintenance. Prime Rib: CHICKEN, LIVER, BEEF, MEAT BY-PRODUCTS, WHEAT GLUTEN, STARCH, WHEAT FLOUR, PEA FIBRE, MINERALS, SALT, SODIUM TRIPOLYPHOSPHATE, COLOUR, VITAMINS, PRIME RIB FLAVOUR, GUMS, SUFFICIENT WATER FOR PROCESSING. Filet Mignon: MEAT BY-PRODUCTS, LIVER, BEEF, CHICKEN, CHICKEN BY-PRODUCTS, MINERALS AND VITAMINS, COLOUR, GUMS, DRIED YAM, NATURAL FLAVOURS, FILET MIGNON FLAVOUR, SODIUM NITRITE (FOR COLOUR RETENTION), WATER SUFFICIENT FOR PROCESSING. Bacon & Eggs: MEAT & POULTRY BY-PRODUCTS, LIVER, CHICKEN, SMOKED BACON, EGG PRODUCT, MINERALS & VITAMINS, GUMS, COLOUR, DRIED YAM, NATURAL FLAVOURS, ERYTHORBIC ACID, SODIUM NITRITE (FOR COLOUR RETENTION), SUFFICIENT WATER FOR PROCESSING.